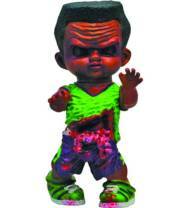 Romper Zombie is a new line of premium collectible urban resin and vinyl zombie figures. The sleepy town of Vida Ville is becoming overrun by brain-eating, flesh-chewing 8-year olds who turned into zombies! Now the 8' tall resin figures are ready to overrun your collection! Choose from Andie, Bobbie, Colie, or Georgie. Don't get too close - they will bite.